According to Canadian Labour Relations, a business resource on Canadian labour laws, “Equal pay for equal work is a major issue in many industries and areas of business.” Indeed a woman will make 74 cents to their male counterpart’s dollar—but that isn’t the only problem women face when going to work. 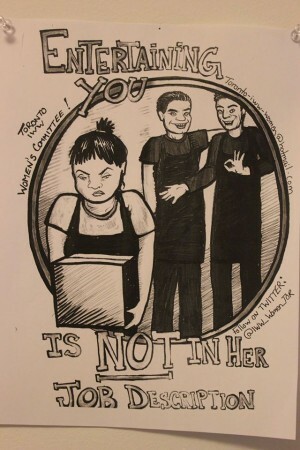 Whether she is high up on Bay Street struggling to prove her worth or serving drinks across the street while being grabbed, or even being followed home after finishing a late night shift, a woman often faces discrimination and harassment in the workplace. Like Canadian Labour Relations points out, some employers’ fear women may not be as dedicated as men in the same job because women will be too family -focused, or not tough enough. The resource page also says women make up the majority of victims of sexual harassment in the workplace; the offenders, according to the site, could be supervisors, fellow workers, customers, suppliers and vendors. The committee started its poster campaign in April, one month after becoming an official committee to the IWW Toronto general membership branch. The poster campaign has been the committee’s first and worked as strengthening friendships and relationships within the committee while fighting against what the committee chair describes as a shared struggle with women in the community and workplace. There is hope that the campaign will inspire other women to organize within their own workplaces too, if not decide to join the committee themselves. The committee’s meeting spaces are inclusive to all woman identified and gender non-conforming people. Though it is encouraged, a committee member does not have to join Industrial Workers of the World, a member-run union open to all workers. New issue on newsstands now!